Autumn has begun and even though it doesn't feel like it here, we still enjoy eating this hearty soup. It will definitely fill you up and make your tummy happy. With plenty of leftovers for lunch and another quick weeknight supper. You can leave the sausage out and it would be a great vegetarian meal, and you can adjust the red pepper flakes to make as hot as you like it or not! For this soup the sausage I used was a chicken chorizo sausage, which gave it good flavor. You can use Italian sweet or mild instead. All the seasoning is adjustable I pretty much just "eyeball" it when I add them, and you can add some later after it cooks for a while, taste it and see if you need to add more. In a large heavy saucepan or dutch oven, I used my Le Creuset French oven that I won from Bo's Bowl saute the carrots, celery, leeks, onions (if using them) in a little oil with the salt and pepper for a few minutes. Then add the garlic, sausage and tomato paste...keep stirring. If you are using bulk Italian sausage you can brown this first and set aside until ready to add to the soup, or add it to the vegetables. Add the remaining ingredients and bring to a boil, then turn heat down to a simmer. Cover and cook for about an hour or so until the lentils are done., and everything is tender. Don't forget to remove the bay leaves before serving, otherwise you'll always get that person...the same one, who seems to always get the dried chili or cherry or olive pit that was left in! Kale! You know I like to sneak greens in when I can....so while the soup was cooking... I washed some kale and removed the hard ribs...tore it in pieces and then added it to the pot! None the wiser....it was gobbled up! Okay, maybe their bowls were liked clean, but I was able to get some good leftovers tucked away into the freezer ready to pull out for another great meal. I added some Italian parsley too...look how big the parsley was! ...don't forget the crusty bread so they can get every drop! We do like to eat soup year round here even when it reaches 90 degrees like it did today, but then it rained and cooled it off some. No sunset walk tonight! EDITED TO ADD: So we decided to go to the beach anyway just to take a walk. Wade needed a break from working on Eric's Ski trying to get it ready for the World Jet Ski Finals in Lake Havasu, AZ in October. We went to the beach and I can't believe that I didn't bring my camera. It was the most beautiful sunset with the clouds being outlined in a bright light, in such an unusual form! All colors of pink, blue sky and purple, orange, beautiful clouds. When we got there every one was looking the other way at the most vivid rainbow I have ever seen, a full rainbow so high in the sky there was no way I would of been able to get a good shot of that! Isn't that the way it goes when you don't bring your camera? This post was shared with Hearth and Soul over at Pemeditated Leftovers. It's still warm here too, but I could go for a bowl of that soup. That is the neatest bowl...It has a built in spoon rest. btw I bought some glutinous rice flour. I know you made some jelly things with chai spice. Where they really good? and have you used it for anything else? What a prefect soup for the fall; love that cute ball. Alwasy forget my camera when the best shot is right there. Oh, so comforting and delicious! I love lentils. Love lentil soup no matter what the season. It just always seems right. This is my kind of soup! I have been using kale in my soup lately as the family loves it. Kale and sausage is a great combination. This is making me hungry. Bring on the spice! That will be perfect for the cooler temperatures in the coming months. Love the addition of kale too. i love sneaking greens into recipes! i feel so bad if i don't have anything green on my plate! Kale in it? Wow, what a healthy and delicious soup! This must be very fulfilling! that looks delicious! sausage. lentil. spice. stew. perfect words to hear for the cold weather. The spicier, the better! Definitely calling for fall. It feels like autumn here and this would be perfect for it. I bookmarked it and will give it a try. I have to check out Italian parsley as I don't believe I've seen it in the markets around here. That happens to me too! Hope you get the next good one! Your soup looks healthy and hearty! I am so happy soup weather is here. Love the healthy ingredients you've used for this soup, simply wonderful! What a soothing and delicious lentil soup! Looks like a great soup Lyndsey. I love the eye-balling of the spices. It's what I do too! Thank you for your kind comment earlier. Lentil soup is a favorite here. Fall is definitely in the air and it's time to get out the soup pot. mmm...I never thought to combine sausage and lentils but I'm sure they go so well together! Bo - Thanks, the bowl is Frankoma Pottery I have a few other pieces. The Muah Chee that I made with the glutinuos rice flour were very good and I will make them again. I haven't made anything else yet, but I will email you when I do. Rita, thanks I was telling Bo the bowl is a Frankoma, it just looks perfect with a hearty soup. Sam, so nice of you to say! Biren, it's a great way to get them to eat greens. My daughter ate it up! OMG, Lyndsey! I love lentil soup, and with the addition of the spicy chorizo, and the kale...so amazing, so hearty and delicious! This soup sounds fantastic! And I love how you snuck in greens. 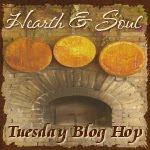 :) Thanks for sharing your delicious recipe with the Hearth and Soul Hop. Ooh I love soup - this looks delicious. I have some spicy Spanish chorizo just begging to be used in this recipe. Our weather is about to turn cool so this will be a good meal next week. This hearty and delicious soup would be perfect for the rainy day we're having today.